jetBlue and Southwest are battling over a few routes out of NYC resulting in some great fares for December and January to a few normally expensive ski destinations, New Mexico being just one of those. NYC to New Mexico runs $300+ during ski season — these cheap ski flights save 40% and get you there on jetBlue or Southwest. While jetBlue does have the cheapest flight ($174 out of JFK) Southwest is almost certainly the better option at $192 out of LGA since all bags (including your Ski / Board Bag and boots) fly free. Assuming you are bringing a ski bag and a second bag for your gear — jetBlue bag fees will run you $55 each way for a total of $110 round trip. So the $174 flights on jetBlue might be best if you are renting and flying light, but Southwest ($192 all-in RT) will save at least another $90 for those bringing a couple bags. Most of the jetBlue dates have non-stop options while most of the Southwest flights do not. Southwest availability is also generally earlier in the season while jetBlue has dates all the way through February. Seems like a reasonable bet for an early season adventure — and a destination that RARELY drops to $220, let alone $50 cheaper. 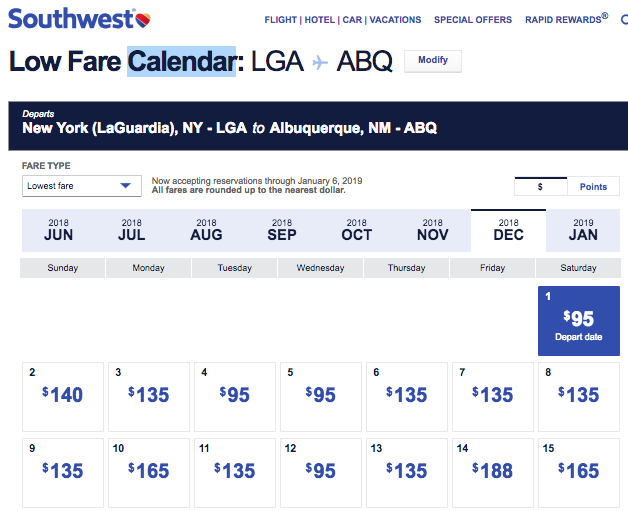 I have actually never seen ABQ this cheap on Southwest (and it just dropped another $5 to $188 as I am finishing this). That should land you on the right calendar. You are looking for the flights that are $95 on the way out there, and either $95 or $99 on the way back. The Southwest sale covers dates up to December 19th, so flights leaving / returning after that are WAY MORE expensive ($300 each way at least). Those $165 each way flights are STILL part of the sale and much less than the normal base price we see for this route from Southwest during ski season. Since jetBlue allows linking through SkyScanner you can use the below per normal.